3M Steri-Strip Adhesive Skin Closures Reinforced are nonwoven, rayon-backed material reinforced wound closures with filaments for added strength. They are breathable and made of microporous material and hypoallergenic adhesive. 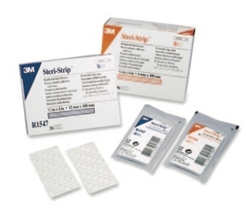 Steri-Strips provides wound support and assists in increasing tensile strength of the wound. They provide a better cosmetic outcome than sutures or staples – less scarring when compared to sutures or staples. They provide enhanced patient comfort and less chance of infection than with sutures or staples. They provide a fast application and are comfortable to wear while reducing the likelihood of skin irriration. Reinforced Steri-Strip Skin Closures are used in the closure of lacerations, surgical incisions and following suture/staple removal.